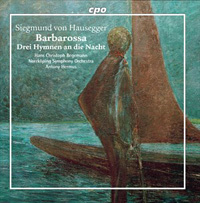 SIEGMUND VON HAUSEGGER (1872-1948): Barbarossa, 3 Hymnen an die Nacht for Baritone and Orchestra. Description: Inspired by a quickly-rescinded inperial edict that all officials in Bohemia and Moravia needed to be bilingual (The Enslavement of the German People! To the barricades! Oh, the pity! ), Barbarossa (1898) is an overstuffed, hyperactive tone poem of 49 minutes whose three sections are “The Distress of the People”, “The Magic Mountain” (where the medieval German hero, Friederich Barbarossa was buried but ready to rise again to lead his people in their hour of need) and “The Awakening”. The 26-year-old composer poured everything available to a late Romantic orchestra into it, climax piling upon climax (and even some strikingly effective quiet writing as the dream sequence in the second part begins) with bits of Richard Strauss, Sibelius, Bruckner, Mahler, Liszt and Raff speeding quickly past. Loads of performances and great public and critical acclaim but, as the notes point out, by a performance in 1917, the audiences, weary of war, lost their appetite for German jingoism and Barbarossa withdrew to its mountain for another century. German-English texts. Hans Christoph Begemann (baritone), Norrköping Symphony Orchestra; Antony Hermus.